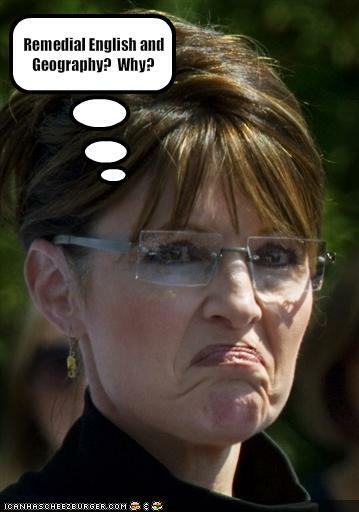 Sarah “Rand McNally” Palin has exposed her geographic ignorance once again. First she told us about, “as Putin rears his head” in Alaskan airspace. She followed that doozy up with not knowing that South Africa is a country. Then she began confusing the fact as to whether her brother received medical treatment as a child in the United States or in Canada. In her ghostwritten book, Palin confused Cedarburg, Wisconsin with Cedar Rapids, Iowa. She also incorrectly stated that Kodiak Island in Alaska is “America’s largest island”. With that sort of geographic ignorance, you would think that the former half-term, ex-quitting Governor of Alaska would shy away from making reference to any particular place in this great nation of ours. But we are talking about Sarah Palin, the woman that has never let a fact get in the way of a good catch-phrase, Facebook posting or Twitter tweet. So, here we go again. Let’s hope that Pennsylvania’s Teapublican voters obey Palin’s command and vote for Raese. That should ensure a victory for Pennsylvania’s Democratic candidate for Senate, Joe Sestak (to the obvious dismay of Pennsylvanian Republican candidate, Pat Toomey). Actually, we can’t blame Sarah Palin for being confused because she was apparently born that way. Nevertheless, would someone please step up and “refudiate” her.